Equities globally performed pretty very today. China was no exception, with trump declaring “substantial progress” was being made with the US delegation meeting with China. Trumps comments were “This is either going to be a very big deal, or it’s going to be a deal that we’ll just postpone for a little while.” Either scenario seemed to buoy the Chinese markets with the Shanghai composite increasing 1.3%. The Caixin Manufacturing index, showed the country’s industrial sector decreasing at the strongest pace in almost 2 years. Indian manufacturing PMI surprised many by rising to 53.9 compared to an estimate of 52.5. 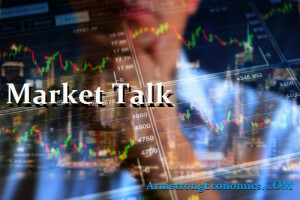 The NIKKEI 225 increased 14.90 points or 0.07% to 20,788.39, The Hang Seng and Kospi were amongst the losers, losing 14 and 6 bps respectively. The Kospi is now up 9.57% YTD – with the KRWUSD slightly down year to date, a very good performer – after suffering a torrid 2018. Wheat prices rose 1.55% and Soybeans 0.90%, on the back of possible bad weather in US & South America and increased optimism on the US-China trade deal. The CAC and the FTSE were the star performers of the day rising 55 and 77 bps. The DAX did not fare as well increasing only 7bps. The FTSE’s YTD figure is now 4.34%, a lessor figure then that of its european counterparts CAC (6.10%) and DAX (5.89%). However, from an international perspective and taking currencies into account the FTSE is performing better as the GBPUSD rose 2.78% YTD and the EURUSD declined -0.16%. More economic data is released from the Eurozone, most European manufacturing numbers were negative and lower than expectations. The only country to post an increase in the PMI number was spain, beating estimates (which assumed a contraction). Euro recovered from yesterday’s slip, rising 20bps against the dollar. GBPUSD is -8bps, but as we see above it has done pretty well YTD. An up-and-down day to start February as a busy week of corporate earnings and economic data came to a close. Monthly jobs report was quite strong, led by non-farm payroll increased by 304,000 in January – well ahead of the 170k expectations. While there was a notable revision down of December’s jobs gains, all-in-all it was an impressive report. Unemployment rate did tick up slightly to 4%. However, hourly earnings average rose only 0.1% – below the 0.3% expected. Institute for Supply Manufacturing (ISM) reported manufacturing expansion; January PMI of 56.6% – up from 54.3% in December. On the China trade talk front, President Donald Trump said he will meet with Chinese President Xi Jinping soon to try to close a comprehensive trade deal. This meeting is likely to take place during Trump’s planned visit to Asia for meeting with North Korean leader, Kim Jong-un. The day finished strong for Treasury’s and Oil, while equities were relatively positive. The Dow closed up +64.22 (+0.26%); the S&P 500 nominally up +2.43 (+0.09%); NASDAQ Composite down -17.87 (-0.25%); and the Russell 2k up +2.64 (+0.18%). Oil continued to rise today a further 2%. The Venezuela argument is still lingering as well as Iran threatening to shut down even more output while U.S. refineries cut back operations. The Saudis also wishes to increase the prices of Oil to balance their budgets.